This weekend went out with an education-filled bang, as I, along with hundreds of other teachers, devoted the last precious days of summer to learning and connecting. While I envy the late sleepers, relaxers, beach bums, and binge watchers, who were able to soak in those last few hours of their respective vices, I was thrilled to have a weekend filled with #edcamps. 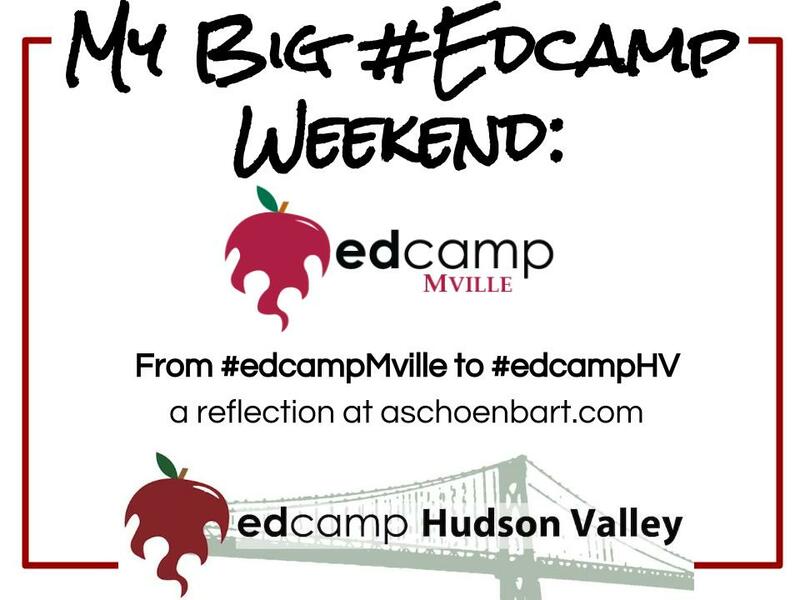 #edcampMville was on Saturday, August 29. If you’re reading this blog or following me on Twitter, you probably know that already. You can even follow the whole event via Storify here. But I’ll let you in on a secret: I was nervous. I was working with people I didn’t know all that well, it was only a half day, and at the end of summer--and at a college, not a school district! Would anyone even show up? And in the end, I realized, everything I worried about and feared turned out to be our strengths. Because it was a first time event and at a college, our attendees were new to edcamp, eager, and diverse. They still travelled NY, NJ, CT, and as far as PA and even TN (Hi, Katrina! ), but didn’t get burned out since it was only a half day. Plus, organizing food for just breakfast and snacks makes the logistics easier, I realized. Since we were at a college, we had teachers, admins, and education students from all over the place. Because school was about to start, they were eager, fun, and excited, with an authenticity that I don’t often see at these events. We had around 70 attendees, gave out dozens of prizes large and small, and filled a session board with 20-or-so great sessions. The sessions ranged in topic--not all were about tech--and were mostly great discussions with honesty and spontaneity, not presentations. We had all of these new-to-edcamp and new-to-Twitter teachers tweeting, on Remind, and social media, and were even #2 trending in NY for a while. I’m a guy who loves to be everywhere with major FOMO--fear of missing out. I loved that as an organizer, I could bounce around to every room, take pictures, manage social media, and experience the event from all sides. Giving out prizes from the swag bag for Remind challenges--like taking selfies with organizers and sharing learning--was so much fun. My favorite part, though, as it usually is, was walking into Dani’s session on Google Classroom, where we wound up co-presenting for a half an hour. Of course we played “Let it Go.” I thought I’d answer before you even asked. This is what #edcamp is all about for me: meaningful learning that fit our needs--it wasn’t forced, overplanned, or perscribed. It was fun, had choice, and it mattered, and I loved it. Of course, I planned it, so I’m likely biased. But I’m thankful and humbled for Tweets, e-mails, and feedback from our attendees! First time I've really, genuinely enjoyed an #edcamp @edcamp in a really, really, really long time. Amazing job @edCampMville #edcampmville! I planned to spend the rest of my weekend relaxing, but was pushed by Dani to attend #edcampHV on Sunday to learn for the both of us. It was an hour away, but as Dani reminded me, I made a decision not to let any cool opportunities pass me by. So I woke up early and off I went--and it was great! It was so cool to attend two #edcamps in one weekend and have very different but wonderful experiences. #edcampHV was BIG--200+ registered and it seemed like most attended. They had something like 8 session in each slot for a full day of learning. They did a wonderful job organizing food, the raffles, and introducing the #edcamp culture. I ended up leading two sessions, the first focusing Google Classroom. Around 40 teachers and I discussed pros, cons, and best practices, using my classes from last year as a model. Then, I attended a fun discussion about ELA CCSS strategies. Finally, I led a discussion about the ways tech is changing teaching and learning. I’d love to do more like this--facilitated discussions and collaboration. This was a great weekend of fun learning and connecting, and I’m excited to take this energy back into the school year. I can’t wait for a weekend to sleep in and relax, which sounds greedy for a teacher at the end of summer, but my big #edcamp weekend was well worth it.